In my country, around this time of the year, people, especially children, write letters to Santa in which they express their Christmas wishes. You have written a lot of good things in Evangelii Gaudium. 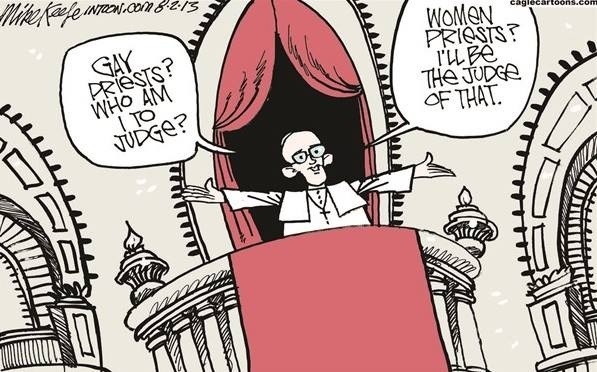 A lot of people like me are looking forward to the Synod in October 2014; but frankly Francis you need to be a bit more courageous. I write today to suggest exactly how. Francis, I have often thought that bishops should be required to get theological certification at least every five years. Perhaps they should be mandated to acquire twenty continuing theological education credits or lose their appointment as bishop of a diocese. I sure wish my bishop would go back to school! He is much worse than you and totally lacks your kind of humility. HE is an unfortunate old fellow…. Anyway. You see I really do like you! Francis you need to call a special synod to study ordained ministry. In fact I will give you the title: MINISTERII GAUDIUM: ROMAN CATHOLIC MINISTRY FOR TODAY NOT THE MIDDLE AGES. You see, like you, I kind of like that little bit of Latin because in college in Detroit I was also a classics major. Francis I suggest a four day synod; and here are the topics for each day, with a bit of explanation. Here we will have some of our best and brightest biblical scholars and historical theologians — men and women of course, but I am sure you already thought about that. They will explore Christian ministry before the Christian community had ordination. And of course they will explore the phenomenon of men and women presiding at Eucharist as heads of households. Frankly Francis you may have to bite your lip on this one. You see Francis, the historic Jesus did not ordain anyone and the notion of “apostolic succession” as an unbroken line of imposition of hands from the apostles down to my parish priest just doesn’t hold water. I don’t know how you say this in Argentina; but in my country we would say the notion leaks like a sieve. Frankly Francis (I like the ring of “frankly Francis”) we need to listen, look, and learn frpm our sister churches. There married ordained men and ordained women minister happily and very effectively. The Church of Rome really needs to get with it. Our other Christian sisters and brothers can help us as we make the big step forward. Remember Jesus told us where two or three are gathered in his name, he is there as well. We have nothing to fear! Francis this is the crowning moment. I am so excited about the possibility that I may book a flight to Rome for my wife and me….YOU AS BISHOP OF ROME can gather a large group in St Peter’s and personally ordain (great symbol and we Catholics love symbols) twelve women and twelve married men. In your homily you can tell the world (CNN and BBC will have all their cameras on you….) that the theme of your papal administration will now be “Tradition AND Renewal”……i.e. Change in the Roman Catholic Church is not only possible but absolutely necessary. Dear Pope Francis, thank you for your attention to my note. What I write about is no small matter. I am happy to discuss details with you and if you send me an email at jadanothervoice@gmail.com I will send you my mobile phone number so we can discuss and work out the details. By the way I am also very good at organizing international conferences…..and I have some friends with money who might help pay for it. I don’t know that Opus Dei would warm up to this. And frankly they don’t like me.Their problem of course…. My very best wishes, Pope Francis, for the holiday season and….I do want to hear from you! PS …..I though about calling you “Frank” but don’t know if you like that. I am officially “John” but prefer “Jack.” Americans like their nicknames but I don’t know what Argentineans, even Rome-based, like…. Great letter, Jack. He’s replied to others; perhpas, he’ll reply to you too. Your letter is certainly deserving of a reply. Terrific combination of tongue-in-cheek and hoof in mouth and telling-truth-to-power. � Happy Advent, Jack. � Pray for me on Monday as I undergo right knee replacement surgery. My prayers and thoughts are with you brother! Thanks for the encouragement, insights and friendship. Wonderful — this made my day. It’s well formulated, insightful and cleverly written. (Apologies if I sound like a professor grading an essay … there may be a reason for that…;-) Many thanks Jack. Thank you for the courage to speak your heart. Excellent and concrete things that Francis needs to do, and very soon. Brilliant letter and marvelous suggestions, I hope you did send it and email it and fed ex it. Maybe an open letter to ncr or to l’osservatore romano or the London Times or the Tablet. We need to get you some exposure. Actually I will send it yo the Tablet! Jack, really send this, and include your phone number. These are some terrific thoughts. Please do send this.There are many women, myself included, who ache every day. We cry out- How Long, O Lord? HOW LONG until we can enter fully into the priestly ministry? I accept it will never happen for me- but I could die happy if I knew the door was open for my granddaughters. It will happen…….We must continue to speak out however. We are not dumb sheep blindly following. Just a thought Jack. If you haven’t sent this already, maybe add a list of all those who support this site? It would perhaps give it more ‘clout’? you ceratinly have my permission to use my name. Good luck. We wait with bated breath. Mari. Thanks Mari. The reactions to this letter have already exceeded my expectations. The hard copy, printed on nice paper, is already in the mail to Pope Francis. And now we can wait for more reactions…It is the start of Advent! Its maybe the start of a lot more than that. Ha! I like it!! Well done Jack.